Marc shares some of the events that happened on this day in history, including the birth of Bayard Rustin and the Carrolton Massacre. And on this St. Patrick’s we hear the great Paul Robeson singing Danny Boy, Robeson stood with the Irish fighting for their liberation from the English. So many wear the green to celebrate this day, and remember the snakes that St. Patrick drove out of Ireland. Well there never were any snakes in Ireland, they were the symbol of the ancient earth religions of Ireland standing in the way of the Church. Today we remember Aaron Anderson, who was born enslaved in Virginia and lived as a free man in Philadelphia. When the civil war began, this Philadelphia chef wanted to fight. At 52 he joined the Navy and on this day in 1865 he was awarded the Navy Medal of Honor. With his ships destroyed, and vastly outnumbered by the Confederates, he manned a howitzer to ward off the Rebels on the Potomac River. His actions turned the day for the Union Navy. 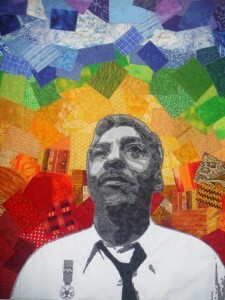 Today is the birthday of Bayard Rustin. Rustin was a civil rights and labor leader who was also one MLK’s key advisers and the chief organizer of the 1963 March on Washington for Jobs and Freedom Now. A life long believer in non violence he was a conscientious objector in World War II .After the civil rights act passed, he continued to be a leader fighting for economic equality and rights for the poor and working class African Americans, and was adamant that the black community needed to ally with the labor movement to fight for economic justice. For some Rustin sexuality was a controversy, for him it was his way of life and for gay rights in America. We remember Bayard Rustin, who was born on this day in 1912. And today is the day, in 1901, when Dutch painter Vincent van Gogh’s paintings were exhibited in Paris. Eleven years earlier, he committed suicide, thinking himself a failure as an artist. The 1901 Paris exhibit cemented his place in art history, and brought his work to the world’s attention. Here’s a song to think about on March 17th. This song was never meant to be a hit. It was released as a b-side to another song, a cover of the Righteous Brothers’ “Substitute” which completely flopped. But deejays loved the b side, and made it one of the most successful disco songs of all time. I’m talking about “I Will Survive” by Gloria Gaynor which hit number one on this day in 1979.